Pet shop owners say stocks are running low - and prices high - as children clamour for a furry friend. According to the Chinese media, prices have tripled to about 30 yuan ($4.20, £2.10) per hamster across the country. In the Year of the Rat, this tiny creature has become the most acceptable rodent, a type of animal that is not everyone's first-choice pet. 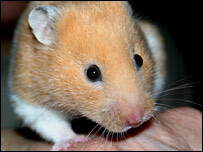 "Rats and mice have a bad image, but hamsters are gentle. You can hold them in your hand and play with them," Xinhua News Agency reported. Pet stores are also reporting an increased interest in other, similar-looking creatures, such as chinchillas and squirrels. But it is the hamster that appears to have caught the imagination at the start of a new lunar year in China. One father told the media: "I've always wanted to buy my son a small animal and a hamster is an ideal choice. "By bringing up a pet, my son will learn about compassion and caring for animals." But there is a downside. Experts are warning that rodents have sharp teeth and can deliver a nasty bite. Some could even be carrying the rabies virus.